While it is important to seek professional help in certain instances, there are several temporary fixes for wooden fences to use in the mean time. 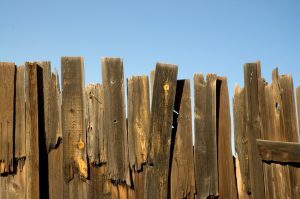 There are several things that can potentially damage your wooden fence. There are pets, wild animals, insects, harsh weather, and just natural decay. Unfortunately, wooden fences have several enemies. While it is important to seek professional help in certain instances, there are things you can do before a professional arrives at your property. Here are some 5 things you can do to temporarily fix your wooden fence. You can staple or nail cardboard over a hole to temporarily camouflage it. Make sure that it does not gap or stick out. However, take note before using this material that it is purely a last resort if you have nothing else on hand or are not expecting any kind of wet weather. This is the least durable of all of your repair options for wooden fences. This should be applied to a fence hole in the exact same way that cardboard would be. This board is far more durable and a better to use than cardboard, as it will stand up to rain. It is also frequently used to make car door panels. If you choose this option for repair, do not leave the sharp edges of the wire sticking out, as this can be potentially dangerous. Use pliers to fold the sharp ends of the cut wires down before attacking it to your fence. In order to attach it so it effectively covers the hole, you will need to make use of staples. Before you use this material, it is important to keep in mind that it is thicker than the other materials mentioned. It is both thicker and heavier, so you will need to use longer screws to get the job done. If you have a thin sheet of metal on hand, you will be able to use it to cover the hole in your fence. You will be able to put it in place with screws. While it lasts longer than other materials, it can rust over time. This entry was posted on Friday, June 30th, 2017 at 2:31 pm. Both comments and pings are currently closed.